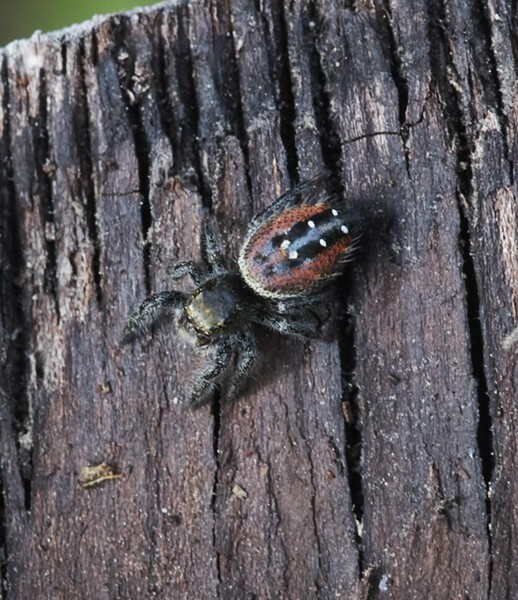 Closeuo of Sierra dome spider (Neriene litigosa). If spring is the season of butterflies, autumn must be the season of spiders. 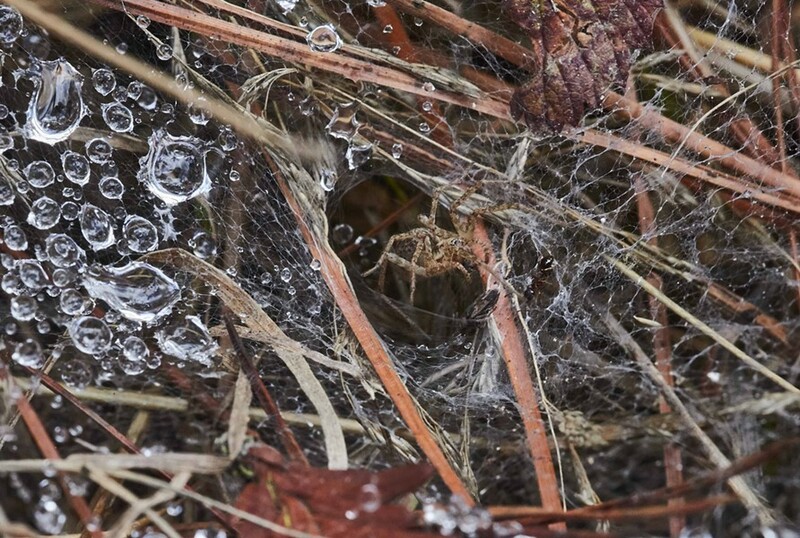 A short walk across some brushy terrain yielded several dozen spiders of at least half a dozen species. 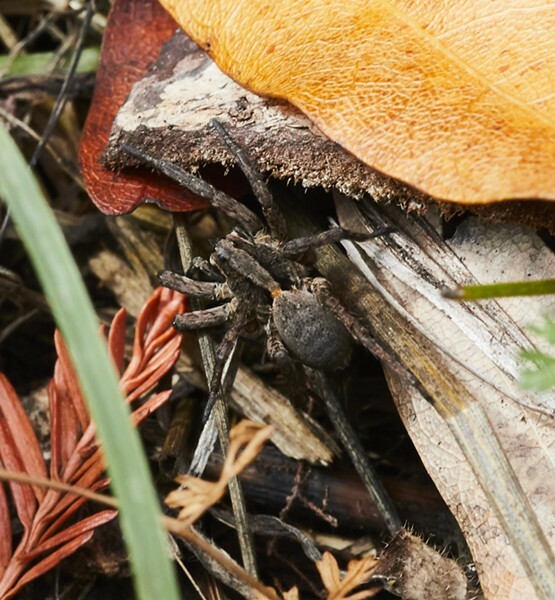 Among spiders, females are often much larger and more conspicuous than the males and, for ones with an annual cycle, this is when they get their biggest, preparing to lay eggs either now to over winter, or protected in their dormant bodies until spring. Ant tries to steal funnel web spider's prey. Funnel webs were everywhere, each one with a spider with a leg span a bit larger than a quarter standing near the entrance to its lair. This family, Agelenidae, is not related to the dangerous Australian spider of the same name. Last night's rain dotted their webs like glitter. 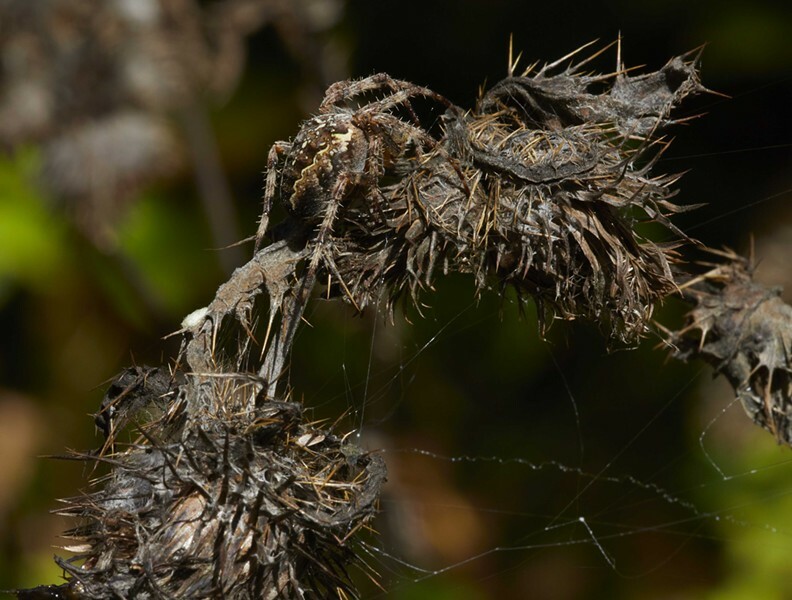 Cross orb weaver female, Araneus diadematus, retreated to thistle where she was well camouflaged. The large cross orb weavers spin their neat vertical webs near the edges of the forest where open meadow gives way to brush. The large females hang in the center of their webs waiting for food to deliver itself and a prospective mate to come calling. 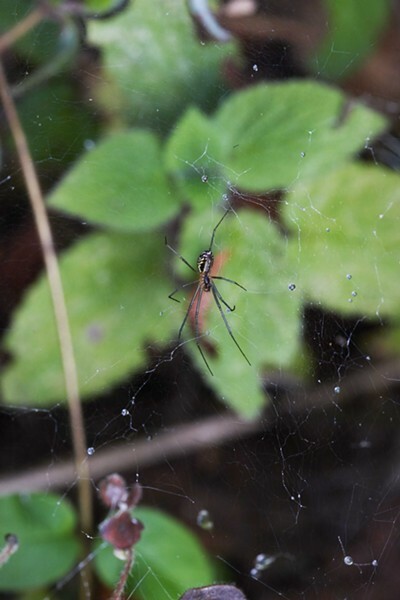 Dome web spiders (family Linyphiidae) hang upside down in their characteristic bell shaped webs. A wolf spider paused just long enough to get a shot. Literally hundreds wolf spiders (family Lycosidae) raced through the grass ahead of me as I walked. Agile running hunters, about the only webs these spiders spin is an egg sack holding the next generation to the mother's abdomen. For a few days after they hatch they will cling to their mom's back, getting a free ride. Johnson's jumping spider Phidippus johnsoni. There is much to like about the little jumping spiders (family Salticideae). Agile runners and jumpers some of their movements are so quick it looks like they've mastered short-range teleportation. Goldenrod crab spider Misumena vatia, missing one front leg menaces the camera. 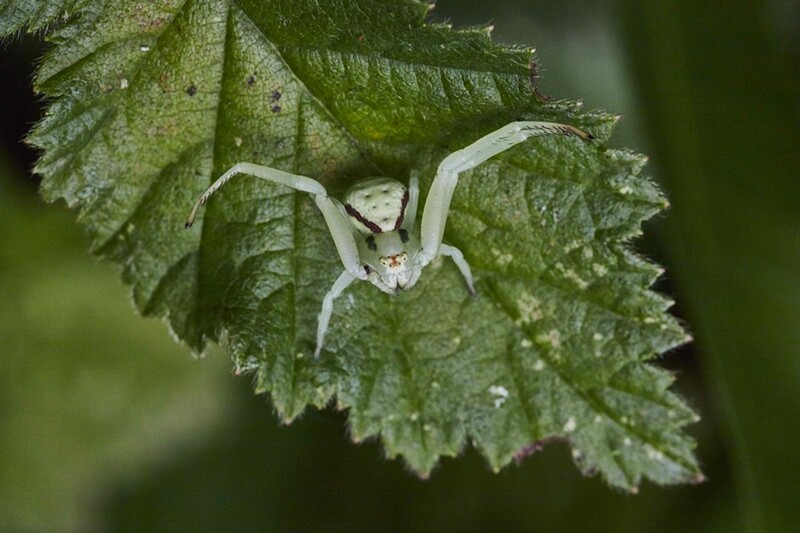 Lurking on or near flowers you can find crab spiders (family Thomisidae). This family doesn't spin a snare either, but is an ambush predator. Although sometimes they give me the willies, spiders are one of mankind's greatest allies, estimated to killing and devouring between 500 and 800 million tons of insects annually. I recently ordered yet another insect identification guide, Pacific Northwest Insects by Merill A. Peterson. Although it is billed as a field guide, this 2-pound 6-by-9-inch book will not fit in my back pocket. It couldn't, as it is the most complete guide to the insects of our area all the way up to British Columbia. Abundantly illustrated with 1,725 good identification photos, it has already helped me verify half a dozen IDs including some mentioned here. I can heartily recommend this book.